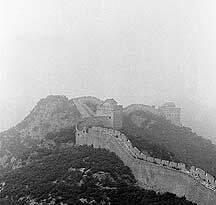 金山岭长城Jinshanling Great Wall belongs to 河北省Hebei province and is administered by 滦平县Luanping county. 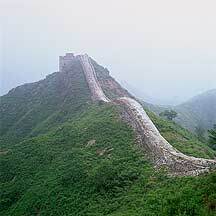 The 10.5 kilometer long Wall rides on the ridges of the Jinshanling mountains that border 密云县Miyun county of 北京Beijing. Along the way, 5 small passes crossed its path, 67 敌楼enemy towers hopped on its back, and 2 烽燧signal towers kept an eye in the area. The old man who guided me up to the western end of this Wall warned me of tigers, but the only thing I saw was a few squirrels jumping along the walls, and some snakes on the sides. I wonder what I can do if a tiger do appear out of the fog. At this hour and still out it's a hungry tiger. Much of the Wall here had been repaired, so it was quite wasy to walk. This is the 小金山楼 Little Jinshan Tower. By the time I reached this tower, it was close to 9:00 in the evening, and although the area was brighter than usual due to the surrounding fog, my injured leg could no longer bring me to the next tower, which is the 大金山楼 Large Jinshan Tower. 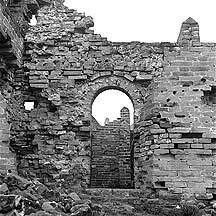 I had hope to spend the night there, which had an open room upstair with a door; but with my bad leg and the fog, which hided the next tower, I decided to spend the cold night here in the company of the ghostly fog sweeping in the arch windows. 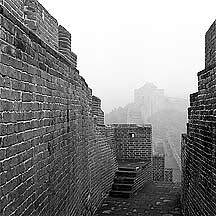 Looking down from the 小金山楼 Little Jinshan Tower, one can see the rows of 障墙 'barrier walls' that runs perpendicular to the side of the Wall. There walls are about 2 meters high. I woke up early. A few hours later a group of 沈阳 Shenyang photography enthusiasts came around. 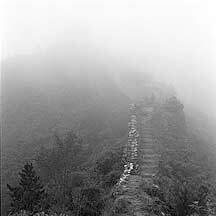 From 古北口镇Gubeikou town I climbed up to the 蟠龙山长城Panlongshan Wall and walked to its end. 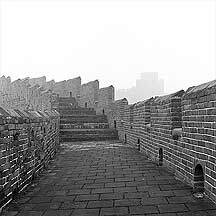 After the Panlongshan Wall is the section known as 五里陀长城Wulituo Wall, which is currently use by the military. To bypass this restricted short section I must go down to the valleys and climb back up somewhere. 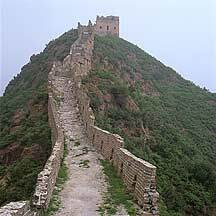 The direction was given to me twice: by Mr. Pang, my guesthouse owner at Gubeikou town, and later by the staffs on the Panlongshan Wall. It appeared so simple: Just get down and come back up. So, on the tower(the 23rd tower) before the last, I followed a narrow and densely vegetated trail down to the valleys below. It was a jungle. At the first minute or so, the trail was in the open, but as I descended further, I was swallowed into a tunnel thick with bushes and trees. The pale sky was sometimes entirely gone and before me the mundane fog weaved through the thicket, obscuring everything but 10 meters from my step. I pushed my way through with my tripod, moving downhill as quick as I can. Several times my exposed arm would bleed with fresh cuts by hidden thorns, but the dew and rain would quickly washed the blood away. Moving down was not difficult as the foot path was mostly straight. What slowed me was the intermittent intersection of overgrown with vegetation and crisscrossed with vines, I would stick my tripod on it to confirm that the surface is solid. Since up on the Wall, rain had drizzled on and off. So now a dull glaze of misty rainwater coated the mountains and fog had taken over much of it. By the time I got down below 15 minutes later, I had an extra kilo of water on me — my sneakers, my socks, my army pant, and my shirt were all soaked. From then there was only a dirt path forward. I walked on and soon reached an abandoned old house with shattered windows and a broken door. Unknown years of waiting through the wind, rain, snow and thunder had darkened it hopelessly. The valley at this point was narrow and filled with wild bushes, grass, weeds and trees. 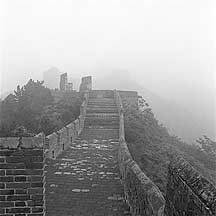 Lingering above, the ubiquitous fog weighted on me, obscuring the fine mountains. I moved on. Around a turn a cornfield appeared. Then more cornfields. 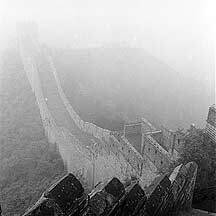 After enough of cornfields, the Great Wall appeared in the distance, above the fog. There the Wall makes a dramatic drop down the valley and up the next hill in huge steps. On the side of the Wall was written these large characters: "军事禁区"("Military Restricted Zone"). I observed a while but didn't see a path up. Nor could I see through the thick fog that had obscured much of the area. In front of the road was a large ground structure that shapes like a well, probably 5 meters in diameter, with a half-meter tall stone wall around it. It has water in it — three-quarters full with plenty of moss around the wall. I didn't know what to do. There was only one clear path so I just moved on. 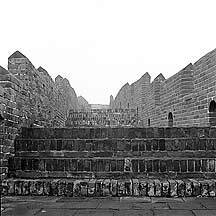 As I passed the ominous well, I thought of what the staff at the Panlongshan Wall said to me: " There will be a tour group going to the Jinshanling Wall later in about an hour, why don't you just follow them." I don't know whether they had come, but I couldn't wait then, nor could I wait for signs of them now. From the well onward, I entered Wonderland. 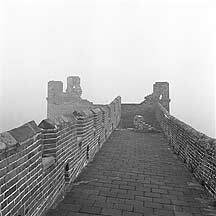 I was to learn later that I should had cut a path up the hills to the foot of the Wall and walk beside it to Jinshanling. As I am writing this I still do not know for certain if this is the spot to climb to the Wall. For the next 3.5 hours I got deeper and deeper into the valleys, and I lost sight of the Wall. Round and round I went, one cornfield after another. I was unable to tell how deep I was lost in this maze of valleys, so I walked quickly to find a way out. Every once a while when the rain stopped dripping, I would stop for a break and took a drink and a bite of one of three energy bars that I had on me. Rain, wetness, the weight of my backpack and the shock of being lost had exhausted me. I came to an old couple who were setting up a large chicken coop outside their mud-house. The whole gloomy valley lighted as I ran to them and asked for directions. The old man looked bewildered, "Jinshanling," he arched his head skyward for a moment then turned to me, "go straight from here. When you see a fork road, make a right. 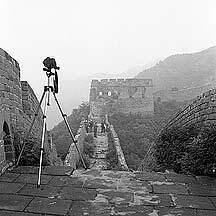 In 1.5 hours you will see Jinshanling." The old woman shook her head while she listened. "Don't listen to him. He hasn't been there." -- To be continued.